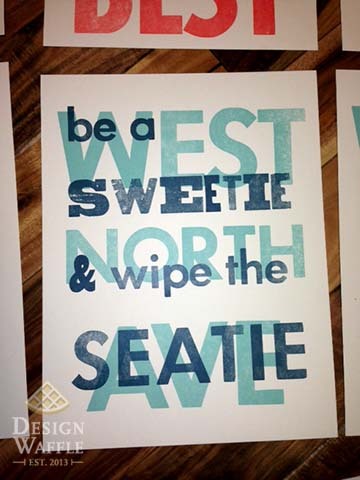 So last weekend my friend Beth and I learned the proper way to letterpress. If you didn’t know already, Travis and I built our own “letterpress” using a bottlejack to provide the pressure. You can read all about it here. Check out the silly posters and coasters our class made! Each group came up with a phrase, chose their font, arranged the type blocks, set them on the press bed (or in a chase for the platen press) and then we started printing. After a while, we started letterpressing over each other’s prints to create new poster variations. I can’t take all the credit for the sayings our class came up with, nor would I want to considering the content… and I spared you the “more interesting” phrases some of the others came up with. Art kids. You never know what’s going to happen with them around. And I can say that because I AM an art kid lol. Anyway, we learned to letterpress on a few different presses: Vandercook No. 4, Vandercook SP20, and two platen presses. After using these presses, I have to say our DIY method at home was VERY time consuming. I was amazed at how quickly we made the prints in the workshop… considering the method. I may have been taking for granted the “print” button on my computer. The posters were printed with wood type on the Vandercook press, while the coasters were printed with metal type on a platen press. I loved the simplicity of the platen press… even though you have to do more work than the geared cylinder Vandercooks. There’s something rewarding about hand placing moveable type on the bed of a printing press. When I learned about leading and tracking in my graphic design classes, I was taught the origins of the words, yet it didn’t quite sink in or make the same amount of sense as actually using leading and slugs between the letters. I have a newfound appreciation for traditional printing methods, as well as modern printing processes. Our little DIY press may get the job done, but it’s nothing in comparison to the letter pressing beasts in our letterpress workshop. If you ever have the opportunity to enroll in a letterpress class or workshop, I would highly recommend it… even if you’re not a graphic designer. It was a ton of fun! 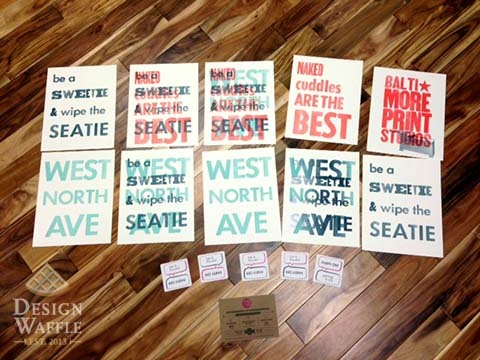 Check out Baltimore Print Studios for letterpress and screen printing workshops. Hourly studio time is also available after taking one workshop. The owners are very knowledgeable and friendly. Thanks for a great class Kyle and Kim! 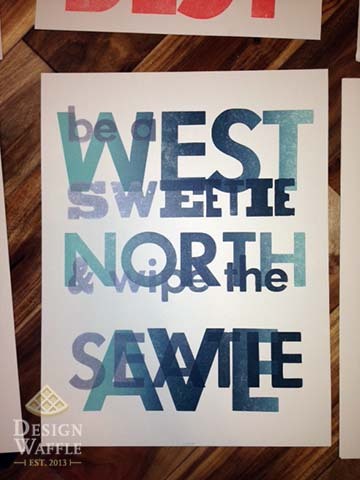 This entry was posted in DIY Projects, Graphic Design and tagged baltimore print studios, Design Waffle, DIY, letterpress, metal type, moveable type, printmaking, vandercook press, wood type. Bookmark the permalink.